Instagram, the popular photo sharing mobile social app, has become popular in recent days. Even after purchase by Facebook, Instagram still rules the photo sharing world via your smartphone and tablet, despite many thoughts on it would be merged with Facebook and catch the integration. That’s the totally different story. However, now you can buy or sell your instagram photos via InstaCanv.as. InstaCanv.as now allows Instagram users to sell their art and photos, which other users will be able to purchase thru Instacanvas. 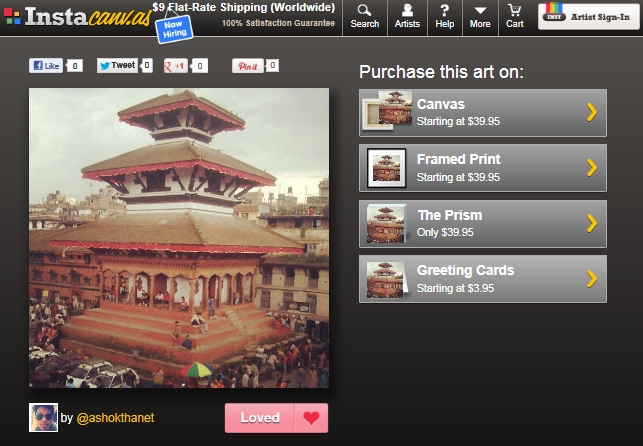 Instacanvas is a marketplace to buy, sell, and discover Instagram art and photography. What is even more interesting is you can discover amazing art by other Instacanvas photographers or artists, which is likely to inspire you for being a better artist. But I’m afraid how will Instacanvas handle the images that are re-shared from original artist, and what about those who take picture of photos. Maybe this is also something Instagram has to work on.